A spiritual man is one governed by the Holy Spirit; if we allow things other than Christ to rule our lives, we won't be spiritual. 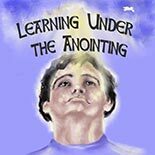 The anointing means Christ has to be Lord. The anointing causes us to keep his commandments.